If an American artist were to say something critical about their government, they might have to endure being chastised by some grandstanding politician. If they had any funding from the NEA they'd probably lose it, and maybe a few galleries would refuse to show their work. In China, an artist who criticizes the government risks surveillance, arrest, beatings by the police, maybe even being thrown in jail for life. 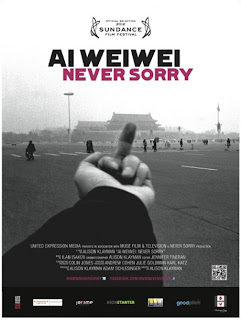 One artist who has taken such risks and (at least at present) remains free to talk about it is Ai Weiwei, the subject of the documentary AI WEIWEI: NEVER SORRY. Like much modern art, Ai's work tends to be highly conceptual, the sort of work those who prefer more traditional art might dismiss – things like painting over antique vases and making millions of stone sun flower seeds, for example. However, seeing the power of Ai's pieces to not only get a rise out of the Chinese government but also influence regular Chinese people might give even the most ardent hater of modern art a little more appreciation for what it can do. 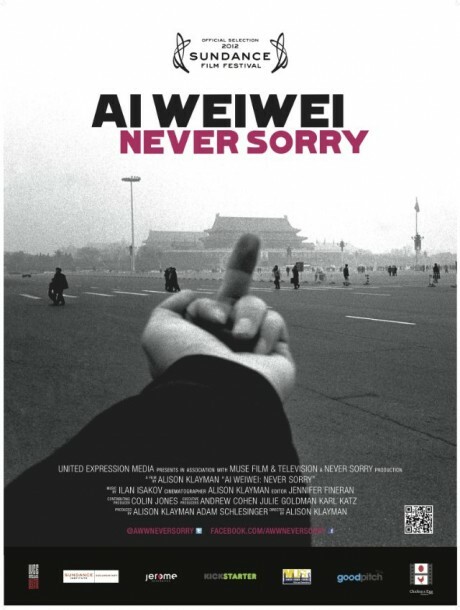 When you live in a country like China and one of your most famous pieces is a photo in which you “flip the bird” at Tienanmen Square (which you can see on the poster above), that's an act of courage. Even more courageous are the various ways Ai has tried to investigate and commemorate the school children who were victims of the Sichuan earthquake, and it is likely this work in particular that ultimately gets him into trouble. Whether Ai's artwork resonates with viewers personally or not, director Alison Klayman's documentary is a highly entertaining and informative film that follows the artist from 2008 to 2010 as he keeps pushing boundaries, eventually finding where the limits are. The film provides both sufficient biographical information about its subject as well as insight into what drives him and what he's hoping to achieve. To this end there are plenty of the usual “talking heads” one expects, but Klayman keeps things from getting dull by balancing that with footage of the artist at work and living his day to day life, including a few confrontations with Chinese police. The portrait of the artist that emerges is of an optimist who still believes in working through the system, even when one's efforts are doomed to fail. As Wei says, “You can't just say the system is broken and give up. Then it's your fault. You must show how it's broken.” 3 1/2 out of 4 stars.